It is developed and maintained by Google which is used to make the development process as easy as possible. AngularJS has become the preferred choice for developers as it helps them to build most maintainable single page applications. It has gained extraordinary admiration by offering an array of elements which has made it very popular among the web application development services. Let's figure out why AngularJS would be the right choice for your next project. Developed by Google: One of the main features of AngularJs is that it is developed and maintained by Google experts which offers a satisfaction to the developers to be working with a complete support to the project. Any development related issue will be directly handled by the Google professionals and community members. Some more frameworks like Ember.JS and Knockout.JS are developed by other open source communities frequently face reliability issues which could not be a problem with AngularJS. High Performance: Spontaneous features, robustness, easy to use and maintain and the competence to build new components and elements are few things which make AngularJS perfect choice for the web developers. AngularJS completely guarantees to offer full help over each stage and productivity of integrating new elements and features into the application. It invents mutual libraries to work with the framework to make it more intense. Fast and Easy: It is extraordinarily simple and quick to use it for front-end development. All you need to add a few attributes to HTML and you are ready to develop an application within no time. Its rich feature set makes development much easier by reducing the need to write the code. Novice developers using this framework for the first time can go through the tutorials which makes it quite easy for them to learn. 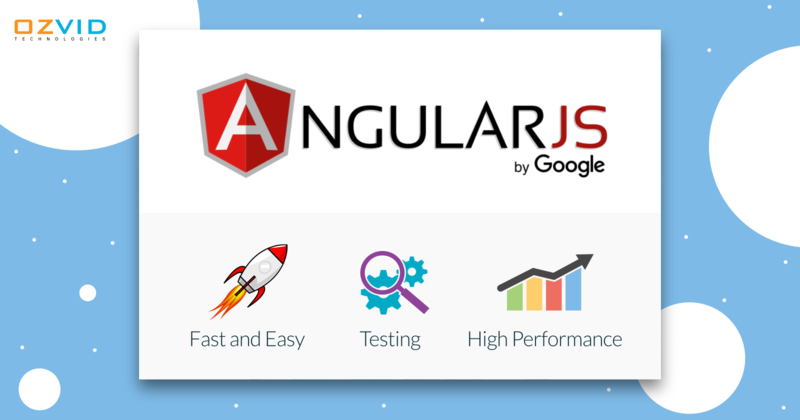 Testing: AngularJS makes the process of testing very simple and efficient. It allows performing both module/unit testing as well as integrated testing. As it is possible to test each module separately, testers can just check the particular module and get it fixed instead of checking the complete application. The module testing in AngularJS saves a huge amount of time and provides crystal clear results.